To learn more, select a topic below. Branches and brush can be placed by the roadside and the maintenance department will pick them up on a regular basis. There is NOT a specific day for pick up. Smaller branches can be broken up to fit in the leaf bags. No materials may be over 8 feet in length or 12 inches in diameter (no piles bigger than 8 foot in length). NO stumps with roots, NO Grass Clippings, NO Leaves, NO boards, Fence Posts, landscape timbers, railroad ties or construction materials. Materials must be piled in one direction, parallel with the street, 4 feet away from obstructions such as fences, mailboxes, parked vehicles, utility poles, etc. The Village does not haul away entire trees cut down by residents. Any trees taken down by a contractor are the responsibility of the contractor. Leaf bags may be used for the disposal of grass clippings, garden waste, branches, and plant materials. If anyone fails to follow the guidelines as listed above, their brush will not be picked up and they will ultimately have to remove the brush at their own expense. NO DUMPING IN THE VILLAGE BRUSH PILE WITHOUT PERMISSION FROM MAINTENANCE. FINES WILL BE ASSESSED! Security cameras are in place and anyone dumping anything on or near the burn area will be subject to fines. If you have brush you wish to haul to the burn pile, you must contact Maintenance each time you do so for permission. Ground infiltration is defined as ground water entering the Village sewer system. It is illegal for any home or business to have sump pumps or down spouts hooked into the Village Sanitary Sewer System. When infiltration occurs we all pay the price. 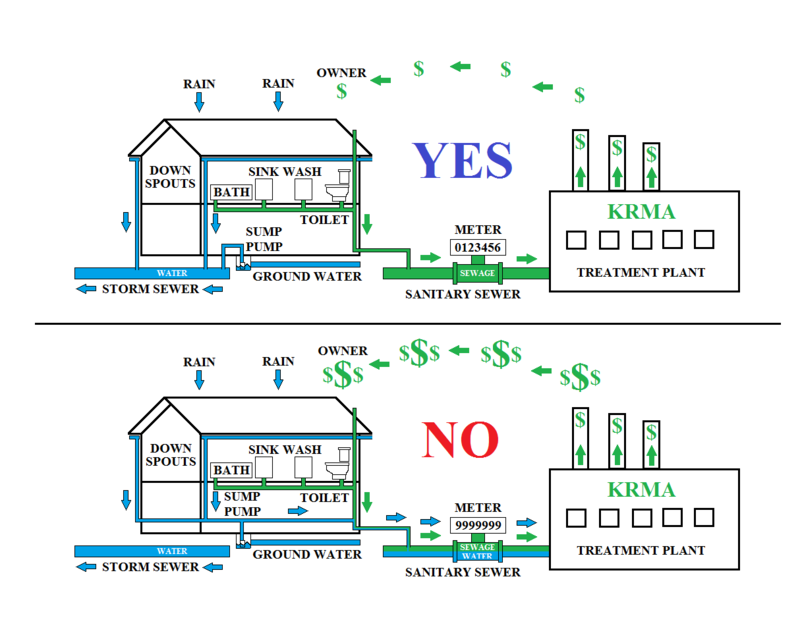 Currently the Village is billed per every thousand gallons of sewer sent to the Kankakee sewer treatment facility (KARMA). If a home or business owner has downspouts or sump pumps feeding into the Village sewer then we all have to pay for what is sent to the treatment plant. If you suspect your sump pump is connected or do not know where your sump pump leads to, please call to schedule an inspection by the Maintenance Department. The Maintenance department is readily equipped to detect infiltration issues with cameras, dyes and smoke testing. Avoid fines and disconnect if you are hooked up! Periodically, the Maintenance department will spray for mosquitoes throughout the Village when the mosquito population becomes intolerable. In order for the spraying process to work correctly, the airborne particulates emitted by the sprayer must physically land on the mosquito in order for it to eliminate the pest. Larviciding is also an effective measure used to prevent mosquito larva from hatching in stagnant damp areas. Larvicide can be applied when the areas that hold water sit for a length of time creating a breeding home for mosquitoes. Spraying alone will not prevent future mosquito outbreaks. It is up to each and everyone of us to do our part to prevent mosquitoes from multiplying. Maintenance personnel James Smith is licensed and approved to spray for mosquitoes through the Illinois Department of Agriculture. Make sure you do not have any standing water in your yard. Be sure to change the water in birdbaths every week. Dump water from any buckets, trash cans, wading pools, old tires, etc. and situate them so water cannot accumulate in them. Keep your gutters and rainspouts clear so rainwater can run freely down them. Simply keeping your grass cut can also assist in prevention. Mosquitoes love dark, damp and warm environments. Mosquitoes lay their eggs in standing or slow-moving water. Weeds, tall grass, and bushes provide an excellent home for adult mosquitoes. -Please report any possible issues you feel may result in mosquito breeding to the maintenance department so that the problem can be resolved before an outbreak happens! Fact: Female mosquitoes lay from 100 to 300 eggs at a time, and it takes from 7 to 10 days to go from egg to adult. Fact: A single used tire can produce up to 10,000 mosquito larva! 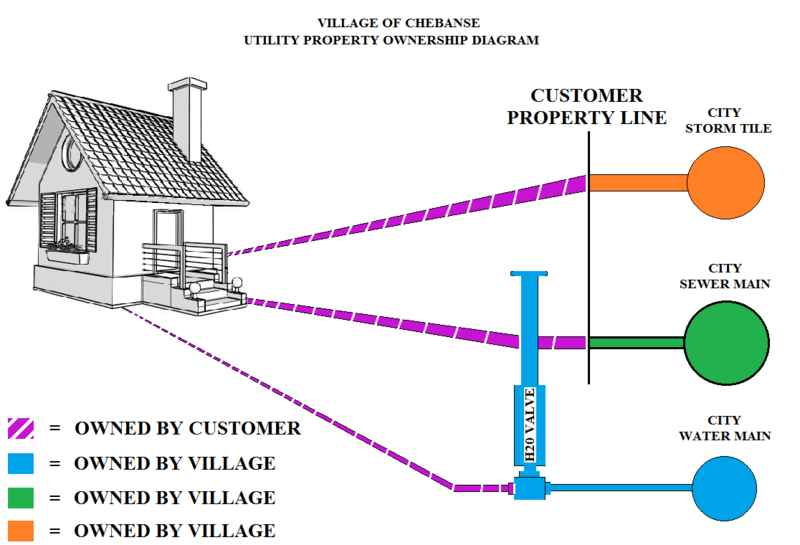 The process of hydrant flushing allows the Village of Chebanse Maintenance Department to test the fire hydrants to ensure a properly working water system. Hydrant flushing is done to improve water quality at the tap, increase the efficiency of the system, and help to uncover potential problems with valves and hydrants. Flushing also is used to remove sediment buildup in the water mains which will enhance the performance of the distribution system and improve or maintain the clarity of the water delivered to your home. During this process of flushing you may notice a temporary discoloration of your water supply, this is normal when the hydrants are being flushed and the sediment is being removed. However to help avoid staining of your laundry, we recommend that you do not wash clothing during the periods of the flushing. Water quality can deteriorate during delivery from the treatment plant to the consumer due to a number of factors. Fire Fighters depend on properly working hydrants with adequate pressure and water flow. A stuck or poor flowing hydrant could literally make the difference between life and death in an emergency situation. The condition of each hydrant is also used for reporting for the Insurance Service Organization (ISO), which rates municipalities' abilities to service fire calls. The ISO ratings are on a scale of 1-9, with 1 being the highest. Homeowner insurance rates are calculated based upon the ISO rating. Q: What should I do when hydrants are being flushed in my area? A: When you see a worker flushing hydrants in your area, avoid running opening tap and washing clothes until the flushing is completed. Drive carefully around an open running hydrant, watch for Fire or Public Works department personnel and keep children away from the crews. Q: What should I do after hydrant flushing? A: Water can become cloudy or discolored and full of sediment if run during flushing. If you experience cloudy or discolored water, shut the water off and wait several minutes. Then run the cold water only for a few minutes for the water to clear up. This may need to be repeated a few hours later. The discoloration only affects the appearance of the water and poses no health hazards. If pressure or volume of water seems low, check faucet aerator screens for sediment. Q: What about running appliances such as washing machines? A: Avoid doing laundry during hydrant flushing. White clothes may become stained if the water is not properly cleared first. Do dark clothes in the first load after the hydrant flushing. Q: Who do I call for more information? Hours are 8:00 a.m. – 4:30 p.m.
Feel free to contact the Village with any questions.